The premier of the 8th and last season of Game of Thrones is right around the corner (April 14th, 2019, but who’s counting!? ), which means it is a perfect time to reflect on some of HBO’s craziest, most creative (and expensive!) marketing campaigns. Over the course of the show, creative marketing minds behind Game of Thrones have come up with crazy, over-the-top gimmicks. The common denominator between all of those campaigns, is that they rely on GoT’s very strong brand awareness. The reality is that none of these campaigns would have worked if Game of Thrones wasn’t one of the most popular TV shows ever created. Can marketeers promoting lesser-known brands learn from these campaigns? Read on to find out. In 2017 HBO made fans tune into Facebook Live just to see an enormous block of ice melt to reveal a plate engraved with the season 7 premiere date. Three million Facebook users watched the streamed event for a whopping 69 minutes. Yes, GoT fans are so hooked on the brand that they’re willing to spend a whole hour watching a block of ice melt. To induce the melting process, followers were encouraged to comment “FIRE.” While the event was highly engaged, it had its downside: fans were upset that the ice was taking too long to melt (after all, winters in the show last for generations) and took to Facebook and Twitter to complain about it. In season 1 of Game of Thrones, Arya Stark ends up lost in King’s Landing. In a dark dungeon under the Red Keep, she discovers huge skulls that belong to Vhagar, Meraxes, and Balerion, dragons of House Targaryen. This scene was the inspiration for an unusual 2013 campaign that promoted the 3rd season premiere of Game of Thrones. A 40 foot dragon skull (the size of a London bus!) 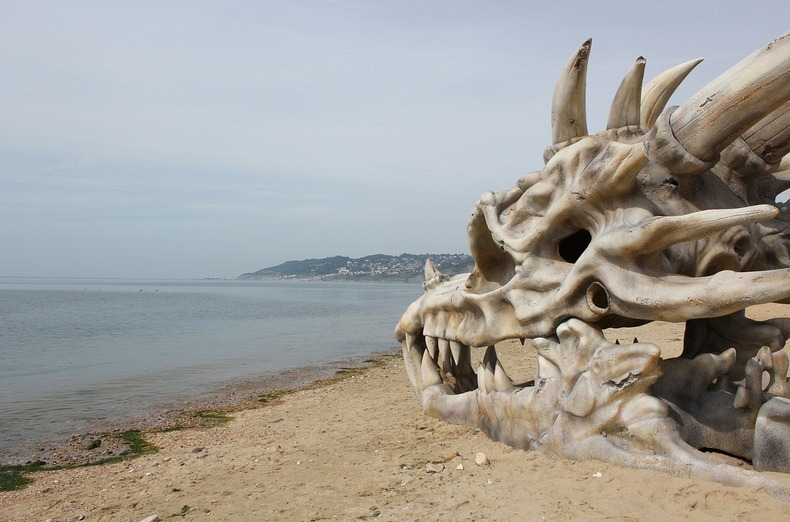 was created by 3 sculptures over the span of 2 months, and was placed on Dorset beach in the United Kingdom (which historically yielded numerous real dinosaur fossils). The impact of the campaign mostly included astounded beach-goers and news media coverage. Brand-awareness-based marketing is quickly becoming a thing of the past. It works for simplified, linear sales funnels, in which the goal is for customers to watch the episode, buy the can of soda, or purchase the candy bar. In this day and age, brand marketers are interested in calls to action that prompt users to visit a landing page, fill in their info in a lead form, make an online purchase, and the list goes one. This type of sales funnel is more complex, non-linear, and includes multiple touch-points as individuals move along the process of decision-making. There are innumerable ways in which customers may choose to engage with your brand. Each customer has their own unique research path in which they define, refine, and subsequently redefine their requirements. Eventually, the customer will zero in on the last product standing and perform our desirable action (or as marketeers call it: “convert”). 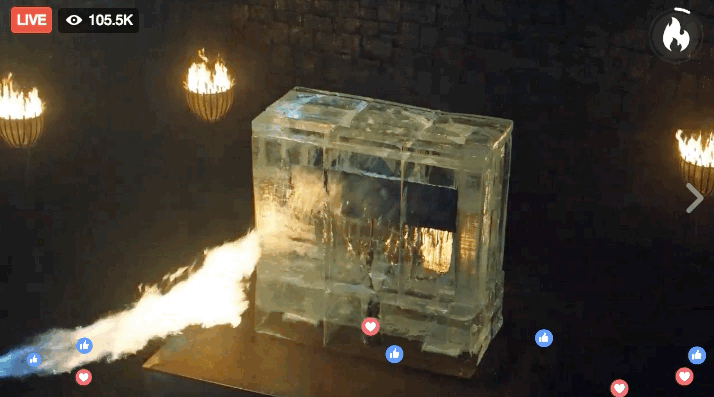 While Game of Thrones’ giant skull and Facebook Live event are extremely cool, memorable campaigns that generated wide media attention, they were not actionable. They did not aim to directly lead the customer through a funnel that ends with a visit, a lead-form, or a purchase. Lesser-known brands with smaller marketing budgets, simply cannot afford to launch campaigns that don’t directly call to a specific action that benefits the growth of their business. To generate excitement around the 5th season premiere, Game of Thrones encouraged Twitter users to help Daenerys Targaryen find her dragon, Drogon, who went missing at the end of season 4. 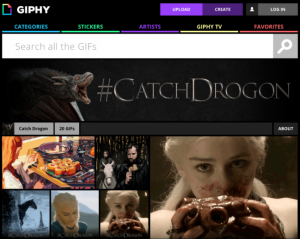 The game, called “Dragon Hunt”, encouraged fans to select GIFs from a designated Giphy page and use them as baits to lure Drogon into their Twitter profiles. The GoT Twitter account would then tweet a GIF of Drogon flying toward the bait. 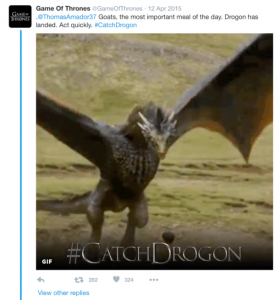 To catch him, users had to quickly retweet the post before it was deleted and the dragon “flew away.” In just one day, the campaign generated over 74,000 tweets, 6.6 million interactions and 1 billion impressions. Another 2013 campaign by Foursquare and Game of Thrones pitted New York City and San Francisco ice-cream parlors against one another in the “Game of Cones”, which was promoted by Foursquare on social media using hashtag #SummerIsComing. The ice cream shop with the most Check-Ins, was the game winner. While the campaign aimed to advertise the app and local ice-cream shops, it also got social media users buzzing about the premier and getting into the spirit with GoT inspired hashtags. There’s a very strong common denominator between the Dragon Hunt and the Game of Cones. Both of these campaigns were highly engaged. Game of Thrones superfans on social media loved partaking in the action and got even more excited about the season premiere as a result. If your KPI is social media engagement, then these 2 campaigns are out of this world. However, if your campaign objective is to grow your customer base – this is an epic fail. Both of these campaigns are like inside jokes – you only get it if you’re a Game of Thrones fan. If you’re marketing a company with a lesser-known brand name and your goal is to expand your customer-base, this isn’t the way to go about this. Let’s circle back to the complex sales funnels of our day and age. Users might not know or care about your brand name. What they do care about, is whether or not your brand has the ability to answer their needs. So how do you successfully market to individuals who aren’t aware of your brand but have a need that it could answer? It’s all about information—valuable, useful, high-quality information. As each potential customer begins their search for a product to meet their needs, make sure to be there as they compare with content like reviews (text and video), news articles, bi-lines, useful blog posts, and more. Companies with limited marketing budgets should certainly stay away from fancy stunts, TV ads, billboards, or any type of non-digital marketing for that matter. Don’t spend your dollars on creating a need—leverage one that already exists for a leaner marketing strategy that is focused on conversion. Yes, enormous dragon skulls, blocks of ice, and a throne made of swords, are super cool, but are they actionable? Do they convert? Is their impact measurable? Not so much. To really nail it, make sure to research and understand your target audience—what are they searching for? What deals are they interested in? What features are important to them? This way, you’ll be able to redirect them to the right landing page, with the right information or enticing offer, at the right time. Remember—90% of customers aren’t committed to a specific brand when searching online to make a purchase (Status Labs), so this is your chance to leverage search intent to increase your brand awareness and drive conversion, while truly maximizing your marketing budget.